Purpose: Knowledge and procedures to develop Critical Chain project plans and to apply Critical Chain Project Management (CCPM). For project teams needing to get projects done in less time, all the time, Critical Chain Project Management provides the method to create unprecedented project success. Critical Chain Project Management (CCPM) manages the uncertainty that causes project failure and project team stress. Unlike complex 1,000 page books reiterating complicated methods that haven't worked for forty years, Critical Chain Project Management helps you focus on the vital few things that ensure project success. Critical Chain Project Management provides practical procedures to build and use CCPM plans. It provides a straightforward explanation of the Theory of Constraints (TOC) underlying CCPM. The text includes many figures and examples that enhance understanding. Hundreds of project teams have already used CCPM to achieve new performance levels, while improving team satisfaction. 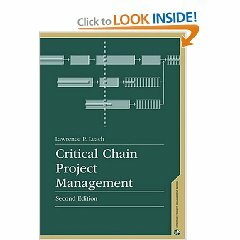 University classes use Critical Chain Project Management as a text. Don't miss out on the first real improvement in project management in over forty years. You'll wonder how you ever managed without CCPM. "I have seen a copy of your book when I was at the institute recently...a great job.."
"...we succeeded to drop our average Turn Around Time per Aircraft Visit from three months to two weeks, and to increase our backlog from two months to one year." "I kept going back to your chapter on creating the project, and found that everything worked just as you said it would. We completed the Critical Chain Project in less than half the time."